The last five years have witnessed an exponential growth in activities associated with the potential use of magnetic nanoparticles in biomedical applications. Our group has been focused on developing synthetic routes for the preparation of magnetic nanoparticles for biomedical applications to produce materials not only with similar physical features but also with similar crystallochemical characteristics. It is well known that size and composition influence the bio-application of magnetic nanoparticles. Thus, for applications in angiography and tumour permeability, ultra-small superparamagnetic iron oxide particles (USPIO) are preferred. However, for liver imaging superparamagnetic particles (SPIO) with intense macrophage uptake are preferred. 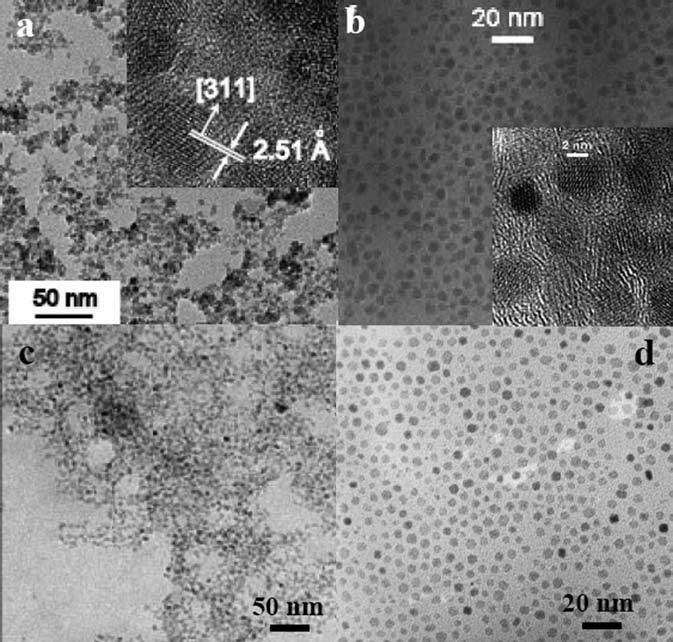 Small magnetite–maghemite nanoparticles prepared by (a) coprecipitation, (b) in the presence of a polymer, (c) microemulsions and (d) thermal decomposition of iron acetylacetonate in benzyl ether.